As we view the current El Niño from late summer through fall 2015, it is on par with the very large El Niño events of 1982-83 and 1997-98. Above normal precipitation may follow the pattern that occurred in strong El Niño years. The Pacific Decadal Oscillation (PDO) is another climate pattern that can reinforce the El Niño precipitation impact in California and Nevada. The PDO is currently in its positive phase, thus the El Niño/+PDO compostie shown to the left may serve as an analog for the current winter. Past strong El Niño events are associated with extensive coastal damage during storms. When storms coincide with high sea levels the damage can be amplified. Please visit our daily sea level anomalies page to see predicted and observed sea level heights at key locations along the California coast. Precipitation is a primary component of El Niño events for San Diego and other regions of the west. This page provides daily updates on the water year-to-date accumulation for San Diego county, California and a collection of stations known as the "8-Station Index". The information on this page allows you to quickly see how current conditions relate to other years and other strong El Niño years. For example, On November 25, 2015, San Diego County was at 8.6% of the water year total which is slightly below the mean of 11.7% for this day. All of California is at 10.8%; lower than the mean of 15.8%. The 8-Station Index is at 9.4%; lower than the mean of 16.8%. For a graphic showing the location of the 8-Stations please click here. Snow accumulation is critical to California's water supply. 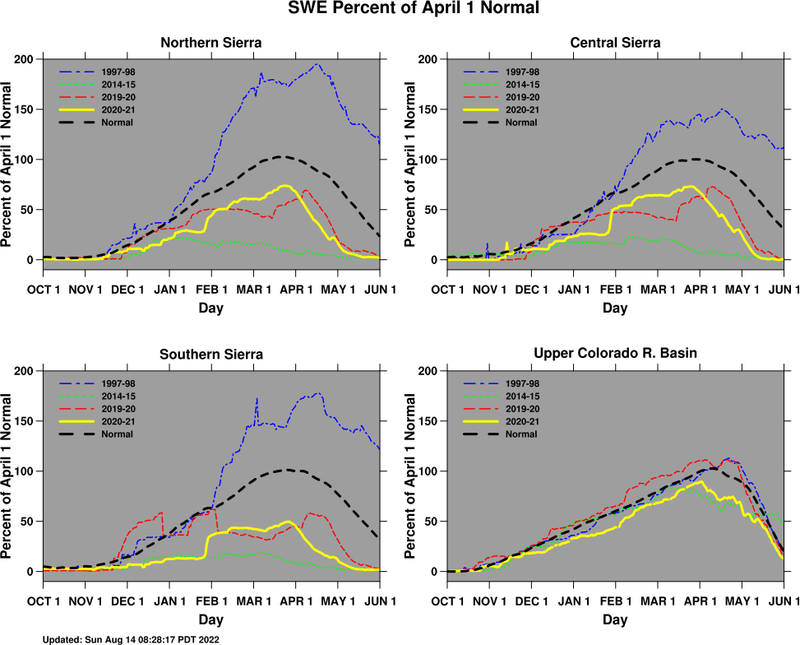 The image below (click to view larger image) shows the percent of April 1st snow water equivalent for 4 regions: Northern Sierra, Central Sierra, Southern Sierra and Upper Colorado River Basin. Recent dry winters (2013-14 and 2014-15), a wet winter (1997-98) and the current winter (2015-16) are shown. More details and data files can be found here. click here for graphics over the last 10 years or since 1900 as a function of timescale. Dought conditions continue to be extreme to exceptional over California and Nevada. The total precipitation over the last three years is at or below 70% of normal over much of California with some areas reporting less than half the normal precipitation. 2015 temperatures in both states are amongst the warmest recorded (since 1895). Recent webcam image of the Merced River at Happy Isles (USGS) Happy Isles (Merced River) Webcam USGS has opened a Happy Isles gage house in Yosemite Valley. CNAP researchers Mike Dettinger and Dan Cayan fought diligently for this new site. The site features a webcam showing the station and the merced River as it enters Yosemite Valley. The old gage house (circa 1915) can be seen in the background on daytime images. Thank you for visiting the California Nevada Applications Program website! This website was prepared by CNAP partially under award NA17RJ1231 from the National Oceanic and Atmospheric Administration, U.S. Department of Commerce. The statements, findings, conclusions, and recommendations are those of the authors and do not necessarily reflect the views of the National Oceanic and Atmospheric Administration or the Department of Commerce.